8 States allow Flight Deductions!! If you live in AL, AR, CA, HI, IA, MN, NY or PA, your state will allow your flying deductions. American Airline and United Airline flight attendants can use our App to upload your schedules. Click here to download the PC app. If you have a Droid device, visit the Play Store to download our mobile app. If you are an Apple user, please give us a call at 317-984-5812 and we’ll assist you in pulling it up. If you are new to Flightax, below is a breakdown of the deductions we as Flight Attendants are allowed. You can purchase your uniform items through payroll deduction or pay for them “out of pocket”. Do not include any items provided by the company through replacement programs on the Organizer. You did not pay for these items, thus no deduction is recognized. The IRS requires receipts for the purchase / maintenance of uniform related items, regardless of the amount you spend. If you purchase your items through the company and have a monthly payroll deduction, the amount on your last pay check stub will be your receipt (we suggest purchasing them this way so you will always have a record). Payroll Deducted – we need the total amount deducted for the year. This can be found on your last pay stub. Out of Pocket – the IRS requires receipts for all uniform items purchased out of pocket regardless of the amount; $75 receipt rule does not apply as this is not considered a “Travel Related Deduction”. Reminder: Uniform Clothing – must have a company insignia or logo to qualify as a deduction; otherwise, it is considered “street clothes” and not deductible. This can be more of an issue for Corporate employees where a specific “uniform” is not issued. If you have any questions, please give us a call at 317-984-5812. Uniform Shoes – You have two types of shoes you wear – Uniform & In-Flight’s; the IRS requires that shoes be purchased from a Uniform Store to qualify for a deduction. What does this mean – if you go to Macy’s and purchase a pair of shoes for work, you cannot take the cost as a deduction. If you purchase your shoes from the ASU or other specific Uniform Store – then you can take this amount as a deduction. Remember – if you go to the ASU, have the item payroll deducted! Support Hose (medical deduction) – If you wear “support” hose, the cost is added to your accumulative medical expense for Medical Deduction under Section O, page 4 (we will make this calculation). If you do not have any other medical expenses, this probably will not benefit you. The IRS requires a medical deduction to be over 10% of your Adjusted Gross Income. If you earned 50K you would have to have at least $5,000 in out of pocket medical expenses to start the deduction. Some states have a lower floor – for example, NJ has a 2% medical floor – which is much more advantageous than the federal. Bottom line, give us the amount and we will determine the deduction! Uniform Maintenance – If you were reimbursed for, or offered reimbursement and failed to request it, the IRS will not allow a deduction. Do not include any expenses for which you were reimbursed, or any expenses for which you could have been reimbursed, but were not. Alterations – if your uniform requires alterations, this amount is deductible. Remember, if you are reimbursed for this expense or eligible to be reimbursed and do not do so, this amount will not be allowed by the IRS. Enter Yearly Amount! Laundry – if you live in one of the larger cities, and don’t have a washer and dryer, you must go to a Laundromat. Whatever you pay for cleaning your uniform items is deductible. Enter Monthly Amount! Home Laundry – if you have a washer and dryer at home, technically a percentage of your water bill, electric bill and depreciation on your washer and dryer are deductible. For simplicity, estimate the monthly cost of your home laundering on your uniform items. It is common for us to see $3 to $4 per week or $12 to $16 per month. Let us know what your estimated expense is per month. Dry Cleaning – monthly amounts are generally no more than $20 to $30 per month; keep all receipts. If possible, make sure your dry cleaner lists the item cleaned as a uniform garment. Satellite / Co-Terminal Transportation – Satellite/Co-Terminal only applies to bases that cover more than one airport. (e.g. NYC covers LGA, JFK, and EWR) Transportation from home to your base airport (company mailbox location) is not deductible; however, if you travel to a point beyond your base, then this portion of transportation is deductible. Below are two examples, if you have any questions, please give us a call to further explain this deduction. Example – your mailbox at LGA but your trip is out of JFK, the transportation from LGA to JFK and back is deductible. This is usually a recognizable expense for commuters who fly into and out of one airport where their mailbox is and are required to fly a trip out of a different airport. Airport Parking – if you pay for parking at the airport – a “portion” of this expense is deductible as long as it is not reimbursed or offered for reimbursement by the airline. To explain further, the IRS deems normal parking for a 9-5 job not to be deductible – every American is required to get to and from work and park with no allowed deduction. When it goes “above and beyond” we have grounds for a deduction. A business person going on a trip for 48 hours at the airport would get a deduction for their parking. The airport is your office – no deduction but you are on a “business” trip – deduction. To pacify the IRS and generate a partial deduction for you, we take 2/3’s of the expense since technically the first 1/3rd, or 8 hours, is not deductible. If you spend $30 on parking – your deduction would be $20 – $10 being disallowed for “normal” commuting expense. Reserve Emergency Cab Fares – if you are on “Reserve” status, you may be required to arrive at the airport within 2hrs for call to duty. You can deduct the cost of cab fares to meet this requirement when called. This is also true if you are called out with less time notice to make a trip. If you can get to the airport faster – you get the trip – generating income to you and tax revenue to the IRS – if you can make money by it, the IRS will give you the deduction. The IRS does not allow a deduction for purchasing a Home Computer/Laptop/Tablet. Even though they are an asset, the airline does not require employees to have them as a condition of employment. The IRS has issued a Letter Ruling (#8615024 & Bryant, U.S. Ct. App. 3rd cir. 74 AFTR2d 94-5440) disallowing a deduction for home computers. The ruling states…”Despite legitimate business use, employees generally may not write off the cost of their computer. By law, a computer must be used for the convenience of the employer and required as a condition of employment.” In private rulings, the IRS ruled an individual may not claim depreciation when the purchase of a computer is optional and not absolutely required by their employer as a condition of employment. All airlines provide computers for their employees to use at operations and the airport. Although they are a huge asset to our jobs, the airline does not require that we have a personal computer or laptop. Thus, they are not deductible. UGH! Printer Ink/Toner/Paper – Although we can’t take the computer itself, you are allowed to claim a deduction for the cost of toner and paper supplies for the printer used when printing your flight schedules, bid sheets or other business related documents. Bidding and Trip Trading Software – If you purchase software to assist you in bidding and trip trading – this software is deductible. Home Internet Fees including DSL, Cable, Aircard, VoIP, Skype are also deductible based on the percentage of business usage – provide annual cost (do not include the part of your bill covering television or telephone if a bundled package). Be sure to retain your monthly statements. Hotel Internet Access Fees while on layovers are deductible for business usage. Tips to Hotel Van Drivers – when you are traveling on your layover and take the limo from the airport to your assigned hotel your tip to the driver is deductible. Generally tips are $1 each way or you “buddy buck”. Be sure to record this in your logbook! Tips to a Hotel Maid are not deductible. This amount is included in the daily incidental per diem rate. This amount will be calculated automatically from your flight schedules. ATM / Check Cashing Fees (while on layovers) – because your jobs require you to be away from home, you can deduct the fees you pay for using your ATM card or fees incurred to cash a check while traveling on layovers. Keep receipts and/or bank statements to support this deduction. All items listed below are deductible for the traveling crewmember as long as you maintain receipts and/or logbook entries per the $75 rule. Note: If you pay a service to trade your trips or rearrange your schedule, these fees may be deductible. In order for you to deduct this expense, you must pick up trips of higher time or end up with a line of higher time or greater paying trips. If you trade from domestic to international, this would qualify since international pays more per hour than domestic. If you trade from an aisle position to a galley position at some airlines, this also qualifies since this position has a higher per hour pay. 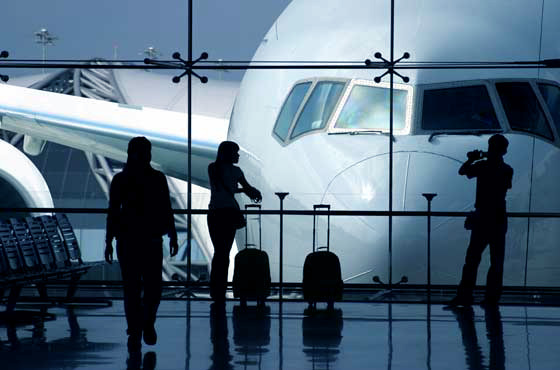 If you drop your trips and don’t fly a full schedule, your trading fees are not deductible. Home phone or basic home phone service is not deductible. The IRS believes that the basic landline service is an expense that most Americans have regardless of their profession. Cell phones, in time, will probably be included in this category. Many of us don’t even have a land line anymore and use our cell phone as our exclusive contact number. Make sure that the amounts you provide to us are for your single phone only. If your plan covers more than one phone, make sure to subtract the added cost of the additional phones. Because your job requires you to be directly accessible to the company, we have the grounds for a deduction. If you are on reserve, this is obvious, but if you are not on reserve, you must also be available for contact by or to contact crew scheduling for non-routine situations, cancellations and mechanicals. You are also using your cell phone to call your supervisor, union or fellow crew members. We have asked you for the amount of your monthly base. Be sure to include taxes and fees. From this base, we will take the deduction based on the percentage of business usage. As a general rule, very few deductions, which can also have a personal use, pass IRS scrutiny at 100% business. Most of our clients tell us the business use percentage is between 50% and 70%. If you believe you have a percentage of business use other than this, please provide the amount in the space provided. Don’t hesitate to call us if you have any questions about this deduction! You cannot deduct cell phones purchased for family members or friends. You cannot deduct monthly fees for phone usage by anyone one other than yourself. If you have a family shared plan, you can only claim fees related to your phone. Percent Airline Business Usage per Month – you need to identify how much you use your cell phone to conduct business with crew schedule, your supervisor, union or fellow crewmembers and /or to contact family while away on layover. Keep your monthly cell phone statements to support your deduction. Calling Cards – Cards billed directly to your home are deductible as well as International Prepaid Cards if you fly Internationally for any type of business usage. The IRS defines Temporary Duty as any assignment that has an expected completion date of less than one year. If your assignment is greater than one year, you do not qualify for this deduction. Do not enter any TDY or SPA days that are included in your schedule. Types of TDY/SPA include new service/aircraft launch, training, recruitment or temporary management positions. You may deduct Union Dues, initiation fees and any union publication expenses. We need the actual amount of union dues paid during the year; usually found on the last pay stub. You may have to add this amount from each monthly pay stub if the final stub does not include a “Year to Date” total. Union Representatives need to complete the “Union Representative Worksheet” available on the Specialty Deduction Worksheet section of our website. You must be in training for two or more consecutive days to receive per diem. Initial Training – as a new hire, you are eligible to receive a per diem for each day you are in training – this qualifies under the “temporary assignment” regulations. Recurrent / Upgrade Training – you must complete recurrent (annual) training to stay current in your job. Per Diem is allowed during Recurrent Training only when performed at a location other than your base. If you are based at ATL and attend two days of training – you are considered “at home” and no per diem deduction is allowed – even if you commute from another location and Atlanta is not your residence. The cost of finding an initial job within the airline industry is not deductible. The job search expenses of finding another position within the same industry are deductible. However, the job search expenses of looking outside of the airline industry are NOT deductible – go figure! Example: A flight attendant updates his/her resume or travels to an interview, these expenses are deductible if he/she is interviewing within the airline industry. If a flight attendant has to fly to an interview for a nursing position and spend the night, these expenses are NOT deductible because they are not within the industry. Clothing purchased for the interviewing process is NOT deductible. Although this is an additional expense to you, it is not a recognized deduction by the IRS. Only clothing that has a company insignia or logo, such as a uniform is deductible. If you transferred bases but did not move your primary home, these expenses are considered a professional deduction versus a moving deduction. Expenses are only deductible if you transferred bases. Shipping expenses include boxes, packing material, etc. Lodging expenses are only deductible while in transit to new a location; no multiple night stays along the way. Hotel expenses at your destination are not deductible. A moving deduction is taken as a professional expense if you transferred bases but did not change your Tax Home – basically a move of your crash pad items and possibly vehicle.